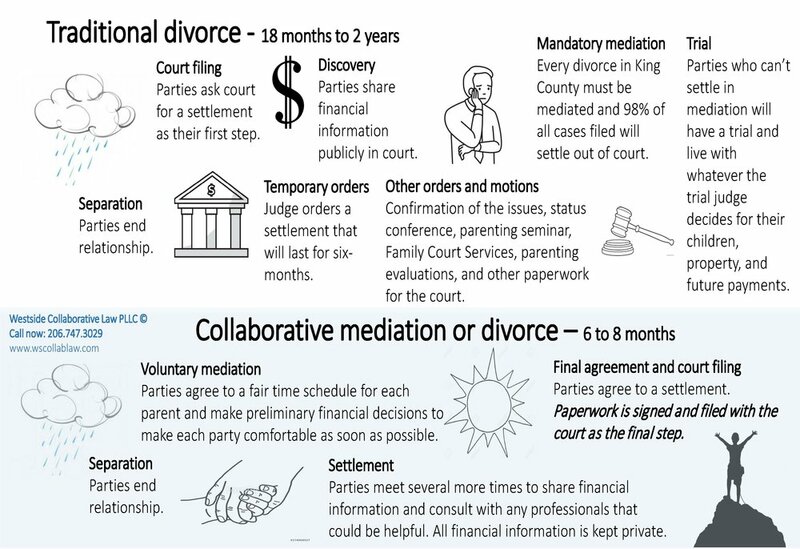 Traditional divorce and collaborative divorce both settle the same issues, just at different times in the process. Most traditional litigation starts with the paperwork filed in court as a first step. We file your divorce paperwork with the court as a last step at Westside Collaborative Law, PLLC. Keeping your paperwork out of court allows you more control and cost containment. You can share the necessary financial documents with your partner before you share the documents with the court. You can settle property for each partner without the extra work that comes with a court filing. And you can work out scenarios and project the income for each partner after the divorce. All of this is faster and easier to do when the court paperwork is not yet an issue. One of the biggest advantages of collaborative divorce is the timing of the filing. By giving you more control and lower legal fees, you can keep more of your money and work out your future together.